Give him enough time, and Peter Tamte will tell you exactly what’s wrong with note-taking apps for the iPad: They’re walled off from other apps, making it hard to turn your notes into tasks and to-dos. They’re overly reliant on cloud storage and syncing, so if you’re offline, your data is often inaccessible. Many of these apps just seem to replace paper clutter with digital clutter, preventing Tamte and users like him from putting notes to any real use. “We take notes because we want to save information that helps us get things done,” Tamte says. And to his way of thinking, too many of the note-taking apps he’s tried on his iPad just don’t let that happen easily enough. Fortunately for Tamte, he runs a software company. So he can create an app that addresses his complaints. 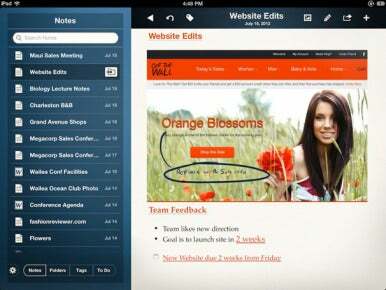 ProjectBook, a note-taking and task management app for the iPad, arrived in the App Store Wednesday. That product, Projectbook, debuted on the App Store Wednesday. It’s an iPad app from Theory.io that looks to combine a notebook with a to-do manager for tablet users. The app can store user-generated notes and sketches, along with Word documents, PDFs, and photos; it can also produce to-do lists while automatically linking notes and documents so that they can be easily found. “Note-taking is to tablets as word processing is to PCs,” says Tamte, Theory.io’s founder and president. And he knows a thing or two about PC software: He started Mac software publisher MacSoft two decades ago before joining Apple as a senior director of consumer marketing. Tamte also has a significant gaming background: He launched Halo during his time with Bungie Software and also founded game publisher Destineer. With Projectbook, though, the focus is on getting things done. The app offers an extensive list of features. You can format text with your choice of 14 fonts, 25 colors, and 16 sizes, along with bold, italic, and underline styles. It has a built-in outliner: Tapping a bullet or checkbox icon puts your notes in outline format, in which disclosure triangles collapse and expand sections of data. You can even reorder items in the outline by dragging them across your screen. 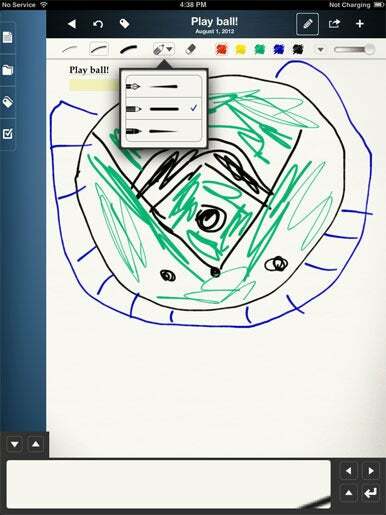 I'm certainly no artist, but Projectbook’s drawing tools allow users to sketch out ideas. Projectbook includes some sketching tools, as well—nothing that will put the likes of Brushes or Paper to shame, but enough to produce some helpful drawings and sketches. The app lets you pick from a trio of pens with three different sizes for each pen; you can also choose between 25 different colors, using an opacity slider to adjust for color. In addition to sketching, you can also take notes with your finger (if you prefer that over the on-screen keyboard). Projectbook provides a helpful Zoom Box at the bottom of the screen; scribble in that area, and the app is better able to fit your handwriting on page. I particularly enjoyed the way the Zoom Box automatically advanced as I wrote, making it a lot easier for me to take notes than similar iPad notebook apps. Projectbook also offers the ability to record audio as you type—ideal for meetings and lectures. Recordings are synced with your notes, so that tapping an area of your notebook advances the audio to that exact point. In addition to taking notes within the app, you can also email text, Word documents, PDFs, and graphics to Projectbook. The app can import files from Dropbox and through the iOS Open In feature; you can also import Web pages using Instapaper or Pocket. Tap a word in a Projectbook notebook, and the app will produce a list of documents that also contain that word. Having all that information in one place isn’t much use if you can’t find it. Pocketbook’s search feature lets you type in keywords that produce live search results—the keyword you’re typing doesn’t even have to be in a file’s title to turn up in your results. The app also lets you organize documents by folders, tags, and dates. Projectbook’s Show Similar Notes option finds documents related to the notebook you’re working in. But there are other ways to track down data in Projectbook. Tap a keyword in one of your notebooks, for example, and a pop-up window will display the other files you’ve stored in Projectbook that contain that word. A Show Similar Notes option in Projectbook finds documents that are similar to the one you’re already working on, based on keywords. Every folder and tag in ProjectBook has a Related Notes folder that can summon similar notes and documents. And you can set up an Active Folder in ProjectBook; similar to OS X’s Smart Folders, Active Folders organize information that matches a specified search term. “We invested heavily in natural language technology that’s optimized for note-taking,” Tamte says. That technology can parse the meaning of content in your documents, allowing the app to recognize related files. As for Projectbook’s task-manager tools, the app has a Make To-Do button that can convert an item in your notes to a to-do. If you type Assignment due in two weeks, the app is smart enough to create that to-do with a due date two weeks from now. You can attach related notes to a project, and use the app’s indent button to add sub-tasks and to-dos. 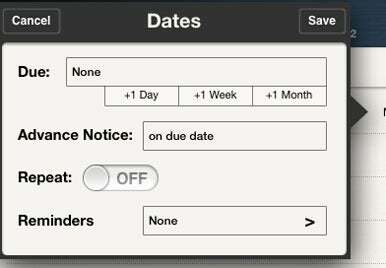 +1 buttons let you assign due dates for tasks in Projectbook. Two task-management features in Projectbook struck me as particularly impressive. When manually assigning to-do dates for tasks, the app eschews the traditional iOS scroll wheel for buttons like +1 Day and +1 Week. (The scroll wheel will appear, if you look for it.) An Advance Notice button also lets you set reminders to get started on a task before it's due. When forwarding emails to the app, if you add TD: to the subject line, Projectbook is smart enough to convert that email into a to-do item. “It gets tasks out of your email and onto your to-do list,” Tamte says. After my brief time with Projectbook, the app struck me as a combination of a note-taker like Penultimate and an information manager like Pocket Informant with any one of the App Store’s multitude of to-do managers thrown in. Tamte has a bigger rival in mind though: Evernote. That note collector’s claim to fame is its ability to sync notes across multiple devices. Tamte argues that such capability is of limited use if you’re not connected to a network or if your connection is unreliable. Projectbook’s approach is to put the information people need in one place. Projectbook is available at a discounted introductory price of $2; the app will sell for $7 after August 15. It runs on the iPad 2 and third-generation iPad. Theory.io has plans to expand Projectbook to other platforms and devices. A Mac version is in the works and slated for a fall release. When that version arrives, ProjectBook will gain the ability to clip Web pages as well as synchronize between Mac and mobile offerings. An iPhone release is also slated for the fall, with other devices on tap after that. The iPad version of the app requires iOS 5.